In Chicago, city and archdiocesan officials had a more earthly concern: whether the roof of an underground parking garage would collapse under the weight of viewers when an estimated 1.5 million people crowd Grant Park for the Pope's Mass. To show that the roof was safe, an engineering firm piled 430 tons of cinder blocks on it last week. 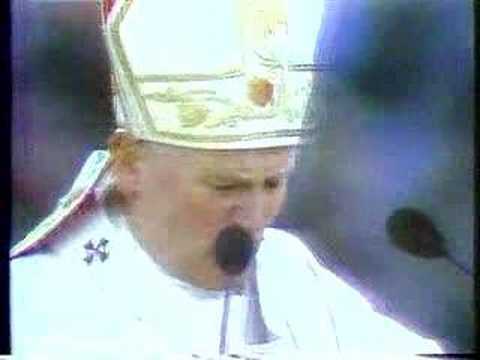 In October 1979, John Paul II became the first pope ever to visit Chicago, drawing a crowd of 1.2 million to Grant Park and bringing a rarely-seen spirit of unity across the city. It was not the first time the man once known as Cardinal Karol Józef Wojtyła visited Chicago. He had most recently been to a Northwest Side church in his role as a Polish cardinal in 1976, the Chicago Tribune reported. But two years later, Karol Józef Wojtyła became Pope John Paul II, and on Oct. 4 and 5, 1979, he drew warm and exuberant crowds at his every stop when he came to Chicago. And for the mere 40 hours in which he was in the city, he brought millions of Chicagoans together, just briefly setting aside their beliefs. The morning after he arrived, the pope's first stop was in Chicago's Latino community, at the Providence of God Church, at 717 W. 18th St. in the Pilsen neighborhood. Parishioners said it was an act of God that brought the Holy Father to Pilsen, and many of them spent the night under a chilly Dan Ryan overpass, awaiting the arrival of el Papa Juan Pablo. Even though Pope John Paul arrived half an hour late, it was to a tumultuous welcome. He addressed the Mexican-American audience in both English and Spanish, praising the Campaign for Human Development – the Church's anti-poverty program – and calling for a strengthening of faith among the poor, the elderly and the sick. The parishioners then presented the pope with flowers and a scroll expressing their concern over the plight of undocumented workers. Within 15 minutes, the visit was over. After blessing the crowd, the pope was off again. But he left behind a memory that was destined to endure. "I was so excited. I don't know who was more excited – myself or the children – but it was just such a beautiful experience," said Sister Dolorine Lopez. "This is something I'll never, never forget." Later, Pope John Paul celebrated a mass in Polish in the Brighton Park neighborhood, where he received a warm welcome from 20,000 people who crammed the parking lot for Five Holy Martyrs Church, at 4327 S. Richmond St. Thousands more filled neighborhood streets. Many had arrived Five Holy Martyrs Church in the predawn darkness. By 5 a.m., many thousands of people had already gathered around the church to catch a glimpse of Pope John Paul and participate in his mass. Boldly printed signs and long, flowing banners were erected, most of them in Polish, and a festive air was seen in many worshipers' traditional Polish costumes. At the time, Chicago had the largest Polish ethnic population outside of Warsaw. In his homily there, the Holy Father referred specifically to the efforts of many Polish people, who were forced by poverty to leave the land of their birth, and yet made great contributions to their chosen homeland in the New World. As part of the ceremony, Pope John Paul offered communion to every Polish parish in the Chicago Archdiocese. Some prominent Chicagoans also attended, including then-police Supt. Joe DeLeonardi, and Eleanor "Sis" Daley, the widow of Mayor Richard J. Daley and the mother of current Mayor Richard M. Daley. As the service continued, the crowd grew larger and larger. Spectators filled every square foot of pavement, before the pope delivered the benediction and moved on to the next stop on his tour. From Five Holy Martyrs, the pope moved on to the Quigley Seminary South, at 7440 S. Western Ave. He attended a special session of the U.S. Bishops Conference, where he urged the bishops to lead simple and holy lives, and repeated the opposition of the Church to birth control, abortion, adultery, and homosexuality. But as with the pope's other stops, a crowd of tens of thousands came to see the pontiff. He came out onto the seminary's balcony to meet and bless more than 50,000 people gathered there. But his words were aimed specifically at a small group of disabled people, whom felt they had been touched individually simply because they were remembered. When the closed meetings with the bishops ended, the pope had a session with young seminarians from Niles Seminary College, St. Mary of the Lake Seminary, and Quigley Seminary South. They presented the pope with a soccer ball as he offered words of encouragement and sang Polish folk songs with them. 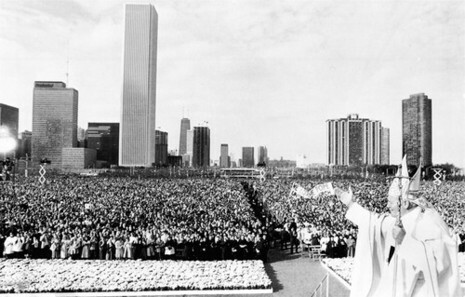 But the highlight of the day for 1.2 million people was the afternoon mass that Pope John Paul held in Grant Park. They represented all different races and ethnicities, and not all of them were Roman Catholic. People came from far and wide, standing throughout the day, fighting and waiting for spots. Many of them called it the most exciting day of their lives. Addressing the crowd, the pope emphasized the ties that bound the crowd together. "There is another reality that I see when I look at you. It is even deeper and more demanding than the common history and union which you built from the richness, beautiful and cultural and ethnic heritages – those heritages that you now rightly want to know and to present," Pope John Paul II said. "History does not expose itself in material progress, in technological conquest or in cultural achievement only," he continued. "Coming together around the altar of sacrifice to break the bread of the Holy Eucharist with the successor of Peter, you testified to this, even deeper reality – to your unity as members of the people of God. We, though many, are one body in Christ." Whether they were among the 1.2 million in the crowd or only able to watch the mass on television, Chicago's Roman Catholics – and many of other faiths – were overjoyed. Late CBS 2 reporter Phil Walters was on the scene during the mass. "Is a love fest the wrong word? But hat's exactly what has going on here today," he said during a live shot. "And so many little details worked out so absolutely perfectly – no trouble at all that we know of." Seventeen thousand chrysanthemums were set up at the altar where the pope stood. Police took them away after the mass and distributed them hospitals and homes for the aged, where residents were unable to attend the mass. After the mass, the widespread admiration for the pope continued as the Holy Father returned to the Cardinal's Residence at North Avenue and State Parkway. He took a break for dinner before going to a Chicago Symphony Orchestra event at Holy Name Cathedral. But during the mass, he still took a few minutes to address the crowd from the residence's portico. 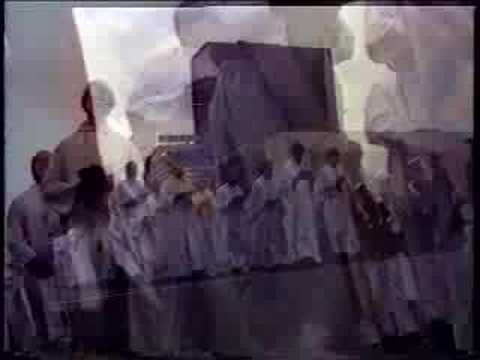 Pope John Paul II flew out of Chicago early in the morning of Oct. 6. It was the only time he visited Chicago, and became a momentous occasion in local history. The stretch of 43rd Street between Kedzie and Western avenues is called Pope John Paul II Drive, renamed in the pontiff's honor the year after his visit.